September is going to be an exciting month, especially if you are a fan of unique jewellery. There are so many, very talented Scottish designer jewellers working in Scotland but the lime light always seems to be in London. For years London has been home of Jewellery Week and many of the largest jewellery shows are down there, such as Goldsmiths Fair, IJL (International Jewellery London). Unfortunately there are not any high profile jewellery fairs in Scotland so it’s hard for Scottish jewellers to showcase their work unless they exhibit in London. I have been thinking for years that there needs to be high end fairs to showcase the amazing Scottish talent that we have here and we should have our own Scottish Jewellery Week. So it’s great that this year a collective has came forward and will host its inaugural Scottish Jewellery Week in Dundee, in which I was delighted to be asked to take part. Scottish Jewellery Week is organised by Vanilla Ink, which is an initiative ran by Kate Pickering, who aims to support new Jewellery graduates and helps them make a mark in the Jewellery world. I wish there was a place set up like this when I first graduated! So what is Scottish Jewellery Week? 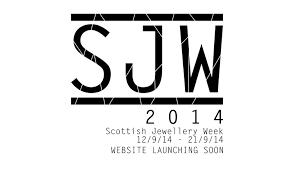 SJW is actually a 10-day festival that will celebrate the ever-growing jewellery community of Scotland. Featuring a programme of exhibitions, a symposium, city-wide studio tours, a pop-up shop and a Jewellery Trail, the festival will add to the already vibrant creative scene of Dundee. SJW kicks off with a symposium on Friday 12th September in association with the Goldsmiths Trust. You can book the free symposium event here. But if you are a massive fan or collector of Jewellery then you’ll love the Jewellery Trail, find out more info here. This is also another free event where you will find out about and meet some of the unique jewellery designers based in Dundee. You will also get the chance to visit my own studio at WASPS, Meadow Mill Dundee. The trail begins on Friday 19th and Saturday 20th September from 12-5pm. This will really be a unique experience, allowing you to see another side of Dundee, introducing you to new jewellers and artists that you have not yet discovered. It would be lovely if you could make it along to the jewellery trail and visit my studio. What will you discover on SJW?